Precious Metals InvestmentAll assets value given enough time has a degree of volatility. Be it currency, equity or even commodity. The best way has always been the oldest way in managing wealth. 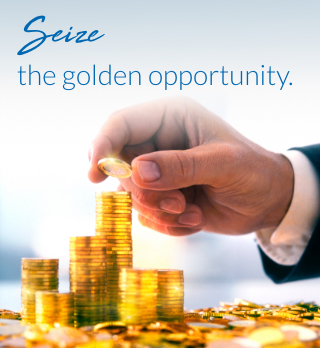 Simply by protecting your wealth in precious metal investments. This is where RHB helps you in investing into the oldest currency of the world for the peace of mind that your wealth maintain it's value far beyond your time. For details please refer toProduct Disclosure Sheet, alternatively please talk to your relationship manager or visit the nearest RHB Branch. The returns of RHB's MCA Precious Metals Investment are subject to Gold and Silver price fluctuation. Customers are advised to read and understand the product disclosure sheet before making any investment. This product is not insured by Perbadanan Insurans Deposit Malaysia (PIDM). The RHB MCA Precious Metals Investment basically allows company or Individual to invest in paper form of precious metals that is Gold and Silver. These precious metals investments will be managed under the current RHB MCA. With RHB MCA, customers can now invest in Gold and/or Silver alongside 17 foreign currency deposits, making RHB MCA truly a diversified "one account". What are my benefits of investing in RHB MCA Precious Metals Investment? I am an existing MCA account holder, how should I start investing and what should I do? You can start investing immediately by visiting your RHB domicile branch. Same procedures apply as buying US Dollars and depositing into your Multi Currency Account. I am interested to invest in Precious Metals i.e. Gold and/or Silver but have no account with RHB, what should I do? Am I subject to any fees and/or charges? Can I withdraw my Precious Metals Investments in physical form from the MCA Account? Is my Precious Metals Investment insured under PIDM? Your Precious Metals Investment i.e. Gold and Silver balance is not insured under PIDM. What are major factors that a precious metal investor should be aware of?